Artwork of a Neo Met from Mega Man 2. Mettaurs (メットール, Metall), alternatively known as Metalls, Mettools or simply Mets, are enemies from the Mega Man series. Mega Man encountering a Mettaur in Mega Man 7. Mettaurs are enemies from the Mega Man universe that first appeared in the first Mega Man game. Since its debut, it has appeared in every Mega Man series except Mega Man Legends. Their original series incarnation, which appears in Super Smash Bros. 4, typically wear helmets that protects them from attacks while they hide inside. When Mega Man is close, they will pop out their faces and shoot projectiles toward Mega Man in three directions: one in a horizontal direction and two in diagonal directions. There are many variations of Mettaurs: some can walk, some can fly, some can swim, and some shoot aimed projectiles. 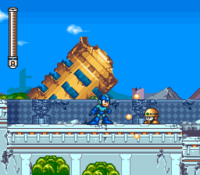 Its attacks in Smash Run are similar to its attacks in the Mega Man games. Mettaur appear as enemies. They hide underneath their indestructible helmets until a fighter approaches them, then fire a three-way shot before ducking again. Behaviorally, this makes them similar to Octoroks, except with a slightly wider shot range. They are vulnerable to attacks only when exposed, but can be grabbed and thrown even when protected by their helmet. Fittingly for their defensive nature, they generally drop Defense stat boosts upon defeat. A familiar foe from the Mega Man series, these guys are pretty distinct with that big yellow helmet. It looks a lot like a hard hat from a construction site. It's pretty great protection - you can't really hurt these guys until they look up from under the helmet. The Cactuspy and slippery New Met are pretty similar. An enemy from the Mega Man series, noteworthy for the yellow helmet covering its whole body. Every so often, a Mettaur will show its face and fire three shots at once. It'll only take damage when its face is showing, so time your attacks carefully. Alternatively, you can just grab it and lob it. Your choice. 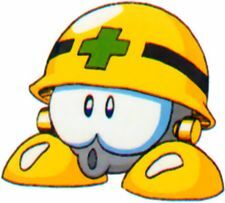 A familiar foe in the Mega Man series, noteworthy for the yellow helmet covering its whole body, which looks rather like the hard hats you see on construction sites. You can't hurt it until its face emerges from under the helmet, so watch for your chance to strike. Similar foes include the Cactuspy and the slippery New Met. This page was last edited on February 18, 2019, at 04:46.